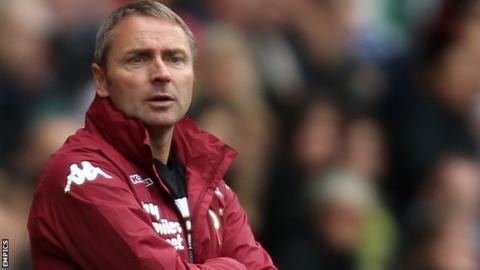 Coach Paul Simpson has said Derby County are focused on being the team to capitalise should Burnley falter in their bid for automatic promotion. Burnley's loss at home to Middlesbrough at the weekend allowed the Rams to move to within eight points of second place. Derby beat Huddersfield to keep their hopes alive with four games remaining. "If Burnley are going to slip up, we've got to make sure we've done our job properly to be the ones to capitalise," Simpson told BBC Radio Derby. "I would still be very surprised if Burnley threw second place away because they have it in their hands. "They have tough fixtures, as we all have. Whether they are starting to get a bit twitchy, we don't really know, but our focus is still on us. "It's a long shot, but we will keep fighting right to the end because we need to make sure that we secure our place in the play-offs as well - that is our first task. "We have worked extremely hard to get to this position. Anything can happen - we will keep going until we are mathematically sure and will keep going until we can't get second place and we will deal with whatever else comes." Derby are next away to strugglers Doncaster, before taking on bottom side Barnsley on Monday. Meanwhile, Burnley travel to relegation threatened Blackpool on Friday then host fellow promotion hopefuls and losing FA Cup semi-finalists Wigan Athletic three days later.